Dust billows and swirls as a loaded dump truck rumbles along its 500th trip down an unpaved dead-end road. 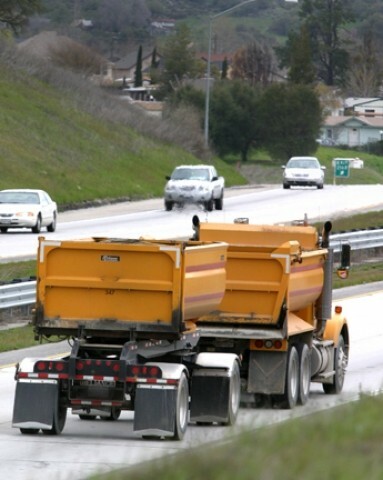 Another full load of dirt is dumped in the bed of the Salinas River south of Atascadero. VIOLATORS BEWARE : Local officials are getting out the word about the high cost of â€œfreeâ€? fill. # Where there were once frog ponds and willow trees, thereâ€™s now a filled-in area as long as a city block. A nearby homeowner rubs his hands with glee at the free soil heâ€™s scoredâ€”from a formerly oak-covered hill at a nearby housing developmentâ€”to level off a playfield for his kids. But this is a dirty game, considered environmental crime of the worst degree. Caught with their hands in the dirt, the homeowner and the dump truck driver are now facing stiff penalties. They may even have to remove all the soil from the riverbed and completely restore the smothered habitat. â€œThese crimes are getting more and more frequent, and more and more heinous,â€? says San Luis Obispo County code enforcement officer Harley Voss. As streamside dumping cases are mounding up at the District Attorneyâ€™s office, regulatory agencies are working together to stem the flow of violations. â€œThe premise has always been â€˜ask forgiveness before asking permissionâ€™, says Voss. â€œThey start work without permits, then start the forgiveness phase after getting caught. Itâ€™s time for people to realize weâ€™re changing the mindset of the way theyâ€™ve been doing it. We want to get the word out, before they get the blade out, that they need permits.â€? Itâ€™s not just new housing developments that are creating pollution problems for local streams. The huge earthworks at Cambriaâ€™s new hillside elementary school eroded into Santa Rosa Creek, impacting fish and frogs. 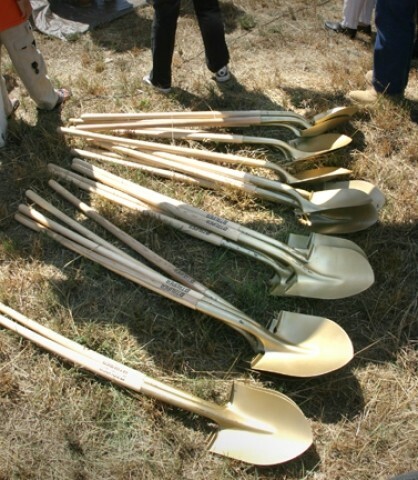 Even the dirt dug up as part of the golden-shovel groundbreaking ceremony at the Los Osos sewer project last October was illegally dumped next to San Bernardo Creek, home to steelhead trout. Once violators know their crime is at the district attorneyâ€™s office for prosecution, they often become â€œvery, very cooperativeâ€? about removing illegally dumped dirt from creek areas, according David Innis, an environmental scientist with the Regional Water Quality Control Board. â€œPeople donâ€™t always know the rules,â€? Innis says. â€œItâ€™s a â€˜This is the way my dad used to do itâ€™ type thing.â€? But Dad, and Granddad, also used to be able to catch tasty steelhead trout in our local streams. These once-abundant fish are now considered a threatened species, and dirt in the waterways is one of the culprits in their demise. GOLDEN TOUCH : Dirt from the Los Osos sewer groundbreaking was dumped near a steelhead stream. # â€œDumping dirt in streams causes sedimentation, which is pretty egregious for steelhead and bad for any aquatic animals,â€? 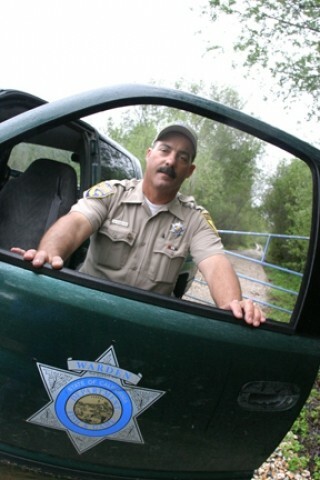 explains Warden Todd Tognazzini of the California Department of Fish and Game.Â With increasing development throughout SLO County, Tognazzini spends more and more of his time working to protect local streams from dirty work. â€œWe used to catch deer poachers in the middle of the night. Now weâ€™re following dump trucks,â€? the warden says. â€œSediment is a serious pollutant, with a serious effect on wildlife and habitat,â€? notes Fish and Game fishery biologist Mike Hill, who has prepared official reports known as Natural Resource Damage Assessments on more than 50 local dirt-dumping cases in the last three years. Sediment in the water prevents fish from feeding and kills the tiny organisms they eat, clogs spaces between their gills and inhibits their breathing, and can cause abrasions and bleeding of their gills, Hill says. â€œSteelhead make a nest in the stream by lying on their side and using their tail to make a depression where they lay their eggs. Then they put a pile of rocks on top of the eggs to protect them from predators, which also creates a vortex so thereâ€™s more oxygen and more flow to carry away their waste,â€? the biologist explains. Dirt also clogs up the gravel and traps eggs. Itâ€™s against the law to dump soil anywhere it can enter a waterway, or to do grading work without a permit, or in excess of the scope of a permit, according to the district attorneyâ€™s special prosecutor for environmental crime, Steven von Dohlen. â€œWith the increase in development, weâ€™ve seen an increase in the number of violations,â€? he says. Von Dohlen is especially concerned about some of the larger firms involved with recent violations. â€œWe always ask ourselves, â€˜Was this an error, or a conscious business decision to run the risk, cut corners, and violate the law?â€™ We want to make sure the punishment has a deterrent effect. Weâ€™re going to continue to make the punishment side harder and more difficult,â€? the prosecutor says. The emphasis in recent cases has been on encouraging violators to fix the problem right away, he says, â€œbefore we tell them the punishment.â€? Their level of cooperation has a bearing on whether their punishment involves jail time and heavy fines, or probation. â€œWeâ€™re saying, â€˜Look, donâ€™t try to do this stuff without permits or it will cost you significantly.â€™â€? Equipment owned by multi-million-dollar business A.J. Diani Construction Co. of Santa Maria has been involved in at least two recent violations, according to enforcement officers. Company spokesman Rick Jackson says he canâ€™t comment on the Los Osos sewer or the Cambria school cases because theyâ€™re in litigation. â€œNormally we donâ€™t dispose of any material unless itâ€™s at an approved site,â€? Jackson explains. He says he doesnâ€™t think itâ€™s a valid observation to say that companies have found it cheaper to ask for forgiveness than permission. â€œWeâ€™re not scofflaws. We donâ€™t willfully ignore the law. But with 250 employees in our engineering division, sometimes one ventures off the reservation and tries to take shortcuts. If they do, they donâ€™t do it again.â€? FISH PROTECTOR : Fish and Game Warden Todd Tognazzini spends more and more time policing environmental crime. # For years, according to the Diani spokesman, it was â€œcommon practice to fill holesâ€? with excess dirt graded from construction projects. The laws regarding stormwater runoff, on the books since the 1970s, have only recently been enforced, he says. â€œI donâ€™t know if itâ€™s valid, or if itâ€™s more junk science. Anyone whoâ€™s taken Biology 101 knows that aquatic life is dependent on the periodic discharge of silt into streams for nutrients. Are we making things worse? I donâ€™t think so.â€? Fish and Game warden Tognazzini takes issue with Jacksonâ€™s comments. â€œI donâ€™t think a steelhead trying to lay eggs in a nest of clean gravel would agree. Steelhead cannot reproduce without clean water. Certainly, natural nutrients do enter streams, but thatâ€™s from natural breakdown of detritus. But dumping 7,000 to 10,000 cubic yards of dirt? I donâ€™t know of any biology textbook that would say thatâ€™s a good thing,â€? the warden says. * About 100 dump truck loads of dirt and eucalyptus trees removed during the groundbreaking for the Los Osos sewer project were deposited on private land adjacent to San Bernardo Creek near Morro Bay. Officials required all the material to be removed. The case is under review by the district attorney. * At the massive new Las Lomas housing development in south Atascadero, 70,000 cubic yards of dirtâ€”7,000 dump truck loadsâ€”left the site, even though the City of Atascadero approved an environmental permit filed by developer R.W. Hertel and Sons which claimed the development is a â€œbalanced projectâ€? (no dirt added or removed from the site) with no environmental impact report required. The developer has now filed an amended grading plan. 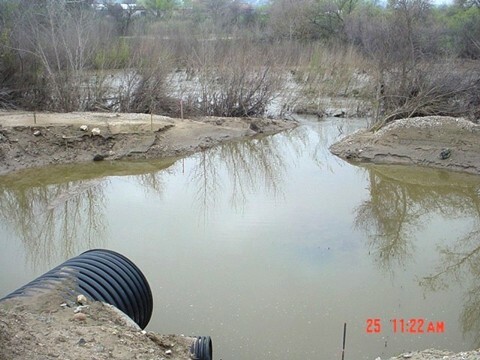 Enforcement officials have determined that around 7,000 cubic yards were dumped in the Salinas riverbed five feet below the high water mark, and some was also deposited at the new Dove Creek development in south Atascadero, but so far they donâ€™t know where the rest of the soil ended up. The case is under review by the district attorney. * A mile-long swath as wide as a football field was illegally graded on the La Panza Ranch near Highway 58, outside Santa Margarita, where piles of earth washed into Huerhuero Creek. The case is with the district attorney. * Also along Huerhuero Creek, near Barney Schwartz Park in east Paso Robles, a giant earthen berm has been illegally installed, using dirt from the Centex housing development near Cuestaâ€™s North County campus. * A contractor is facing the revocation of his license by the State Licensing Board, after illegal grading along Seventh Street near Peachy Canyon Road in Paso Robles. Even with four stop-work orders from code enforcement officers, the contractor continued grading work. * Grading work for a new avocado orchard on Turri Road resulted in bare soil piled up in the riparian zone of Warden Creek, near Los Osos. The landowner has been cooperating with authorities to restore the habitat and repair the site. * The â€œHeritage Loop improvementsâ€? near Lake Nacimiento, where 224 homes and new roads are being developed, resulted in dirt being dumped in a creek. Wetland specialists have been called in, and the U.S. Army Corps of Engineers is also on the case. Tognazzini says, â€œOften environmental laws arenâ€™t considered that important in criminal cases. Weâ€™ve gained a lot of ground in my 20 years on the job, but often we donâ€™t hold people responsible for environmental crimes. Weâ€™d like to see more accountability related to these cases.â€? FOLLOW THAT TRUCK : Enforcement officials ask anyone who suspects illegal dumping near a creek to call CalTips at 1-888-334-2258. # Penalties havenâ€™t been severe enough to have a deterrent effect in the past, he notes. â€œWhen youâ€™re looking at a multi-million dollar housing project, civil disposition or probation and a $3000 to $5000 fine isnâ€™t much.â€? Deputy district attorney von Dohlen says the increase in development is responsible for the increase in cases for the environmental crime division, along with better identification of violations by agencies and citizens. â€œOur goals are first, to stop the violation, then fix the violation, recover the costs or damages caused, issue the appropriate penalty or punishment, and take whatever action has a satisfactory deterrent effect to prevent that violator or others from doing it again. Lately weâ€™ve been encouraging violators to fix the problem right away, because itâ€™s an ongoing threat to the environment. The court fight can wait. The sooner they fix the problem, the greater the protection for the environment,â€? he says. â€œThe reality is, they canâ€™t proceed with their building project till they fix the problem. They could have stopwork orders, their permits or their license revoked, so there are several incentives for the violator. We donâ€™t want to fall into a pattern where the violator thinks heâ€™ll do something with or without a permit, and if heâ€™s caught heâ€™ll fix it, and if not, he got away with it.â€? Von Dohlen adds, â€œOur goal isnâ€™t to sit in the bushes and wait to catch people. Ideally weâ€™d like to educate people up front, to steer them away from violations. If weâ€™re not vigilant about how people treat and respect our waterways, itâ€™s a slippery slope. The line is, donâ€™t put anything where it can get in the waterway unless you have a permit.â€? He warns property owners and contractors not to scrape away â€œnatureâ€™s protective layer against erosion,â€? adding, â€œA scraped, denuded environment can cause a mudslide into a waterway, and have a huge impact on wildlife, or cause flooding up- or downstream. Those are the domino effects people may not realize.â€? Regulators from all the agenciesâ€”Fish and Game, the Regional Water Quality Control Board, and SLO County code enforcementâ€”agree that more education is needed, along with getting the word out about harsher penalties including site restoration. As John Kenneth Galbraith noted in The Affluent Society, â€œThe greater the wealth, the thicker will be the dirt. This indubitably describes a tendency of our time.â€? Or, as rockers AC/DC sing, â€œDirty deeds, and theyâ€™re done dirt cheap.â€?